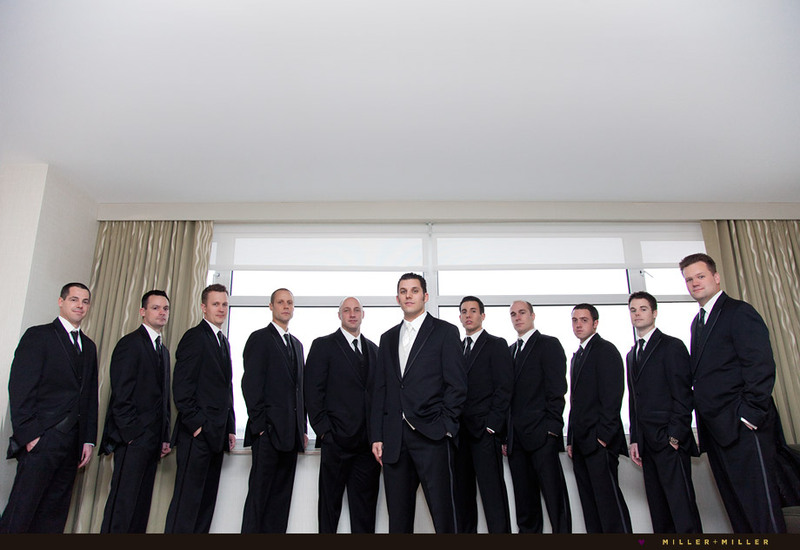 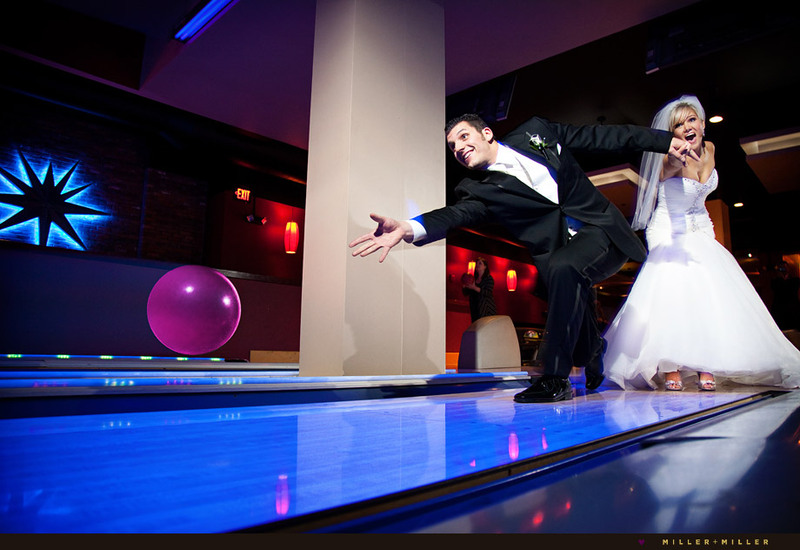 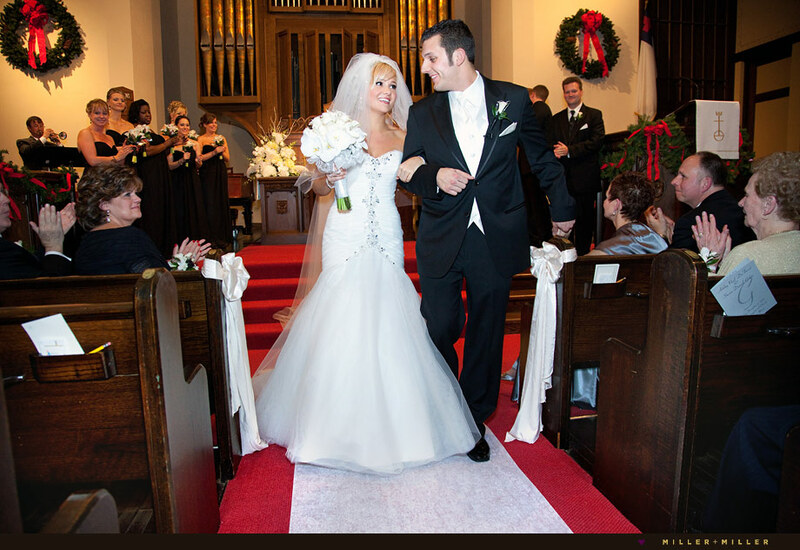 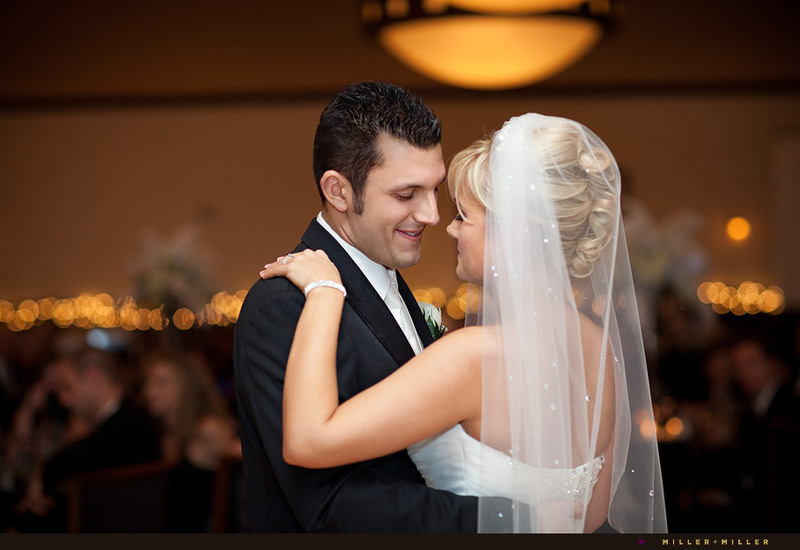 “Steve + Ashley’s were married in the evening on New Year’s Eve day. 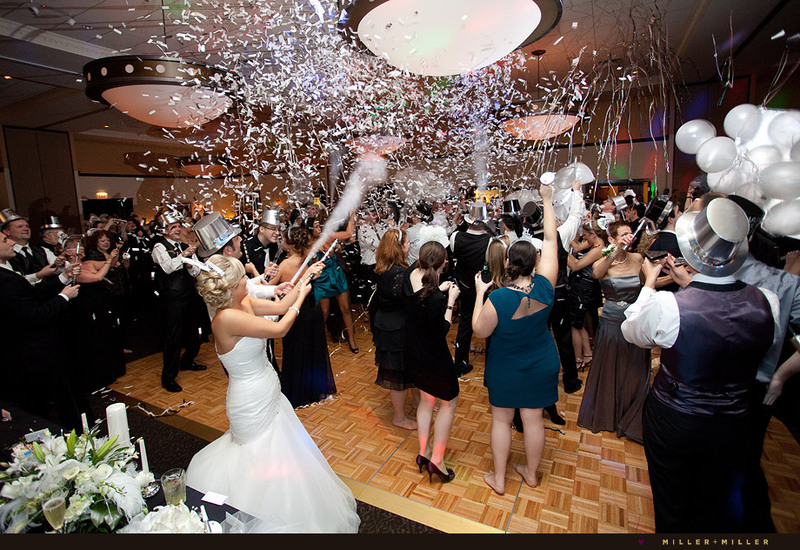 And once the day’s festivities began, the party basically never ended! 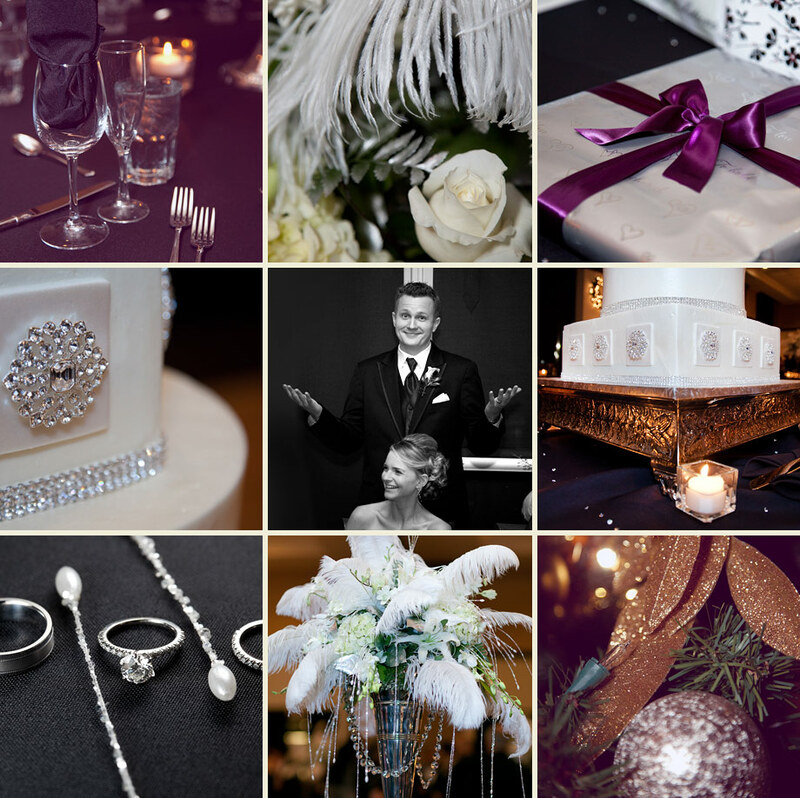 It was a combo of both a fabulous New Year’s Eve party and romantic wedding with a TON of celebrating. 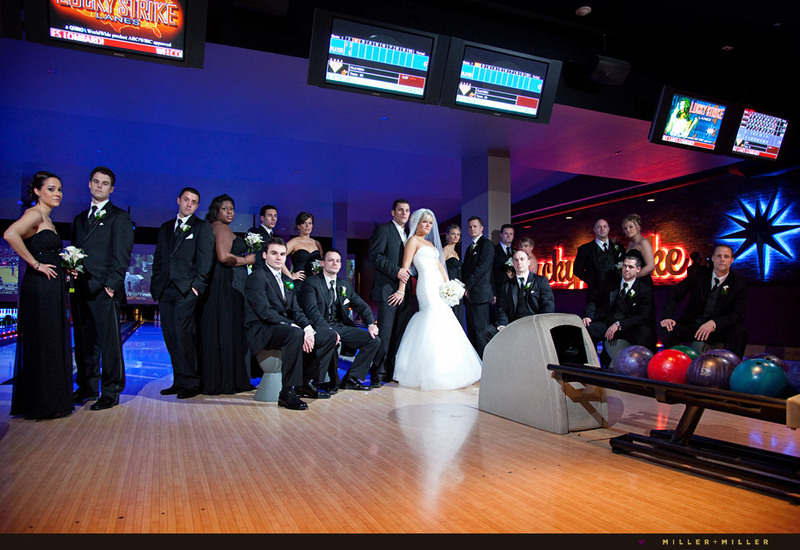 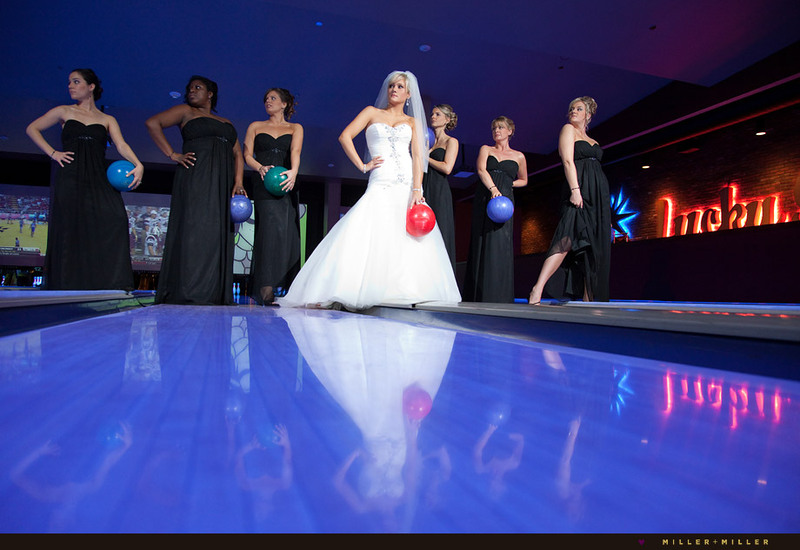 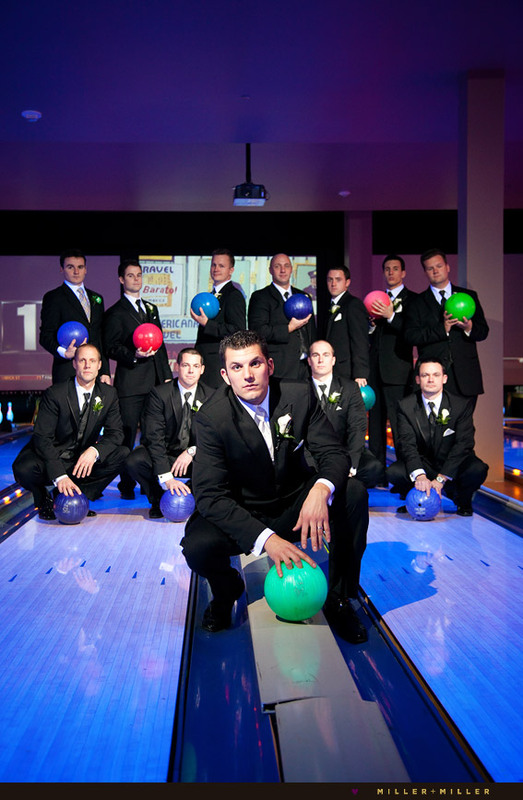 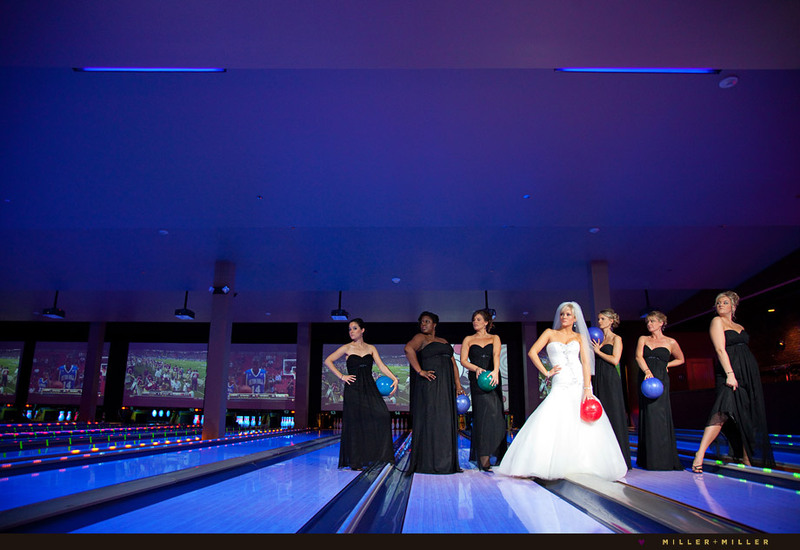 What a fun way to ring in the year in attending a Chicago New Year’s Eve Wedding! 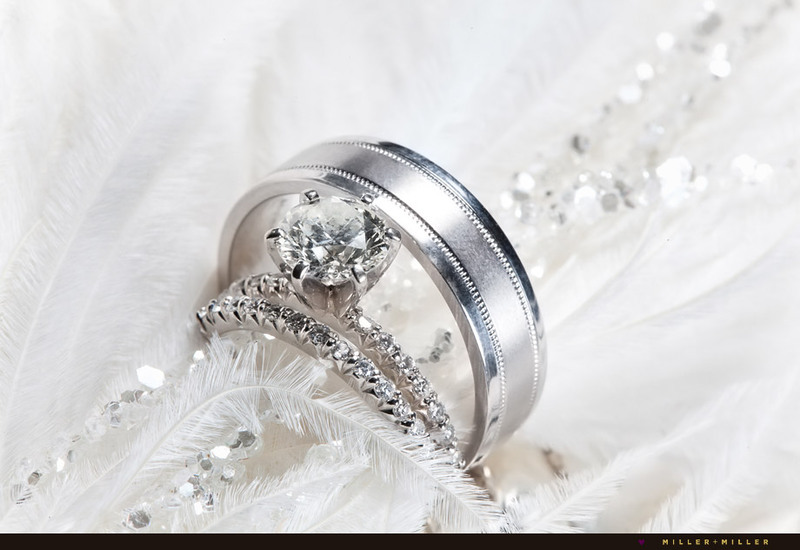 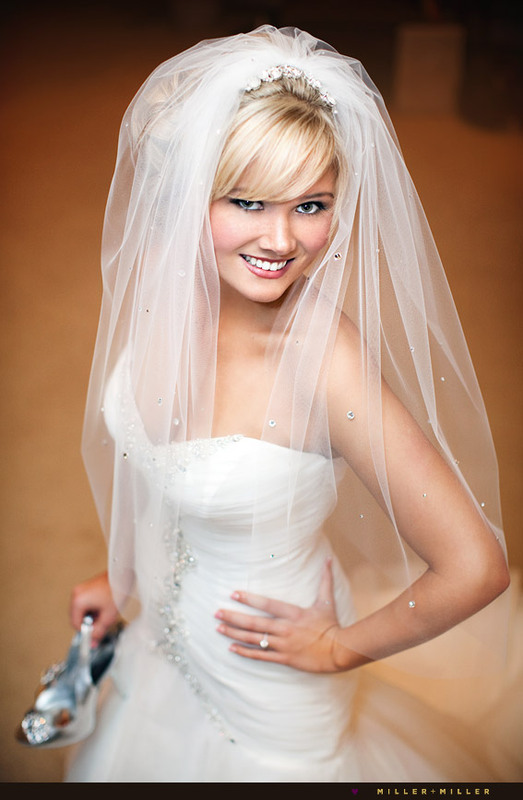 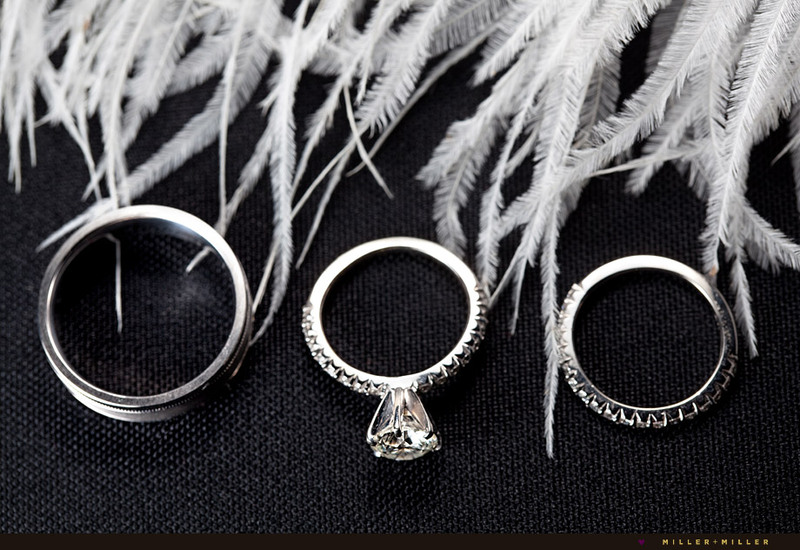 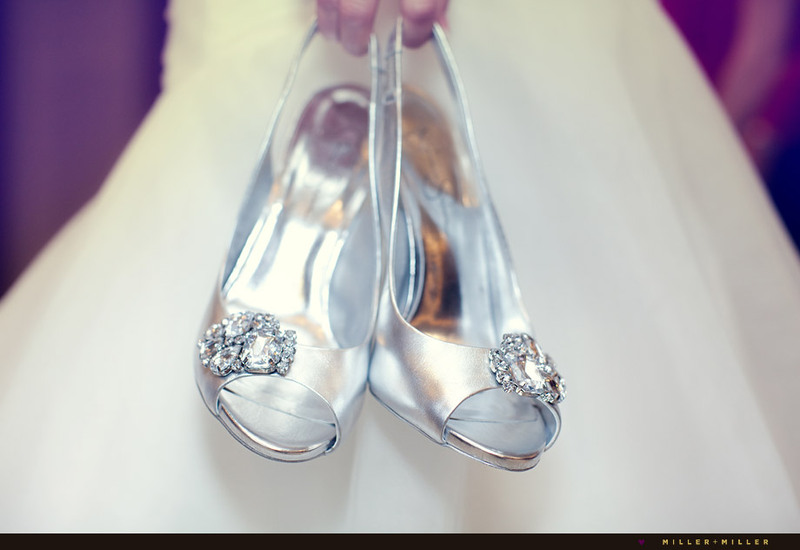 Ashely coordinated a theme… the day was full of sparkle and TONS of bling. 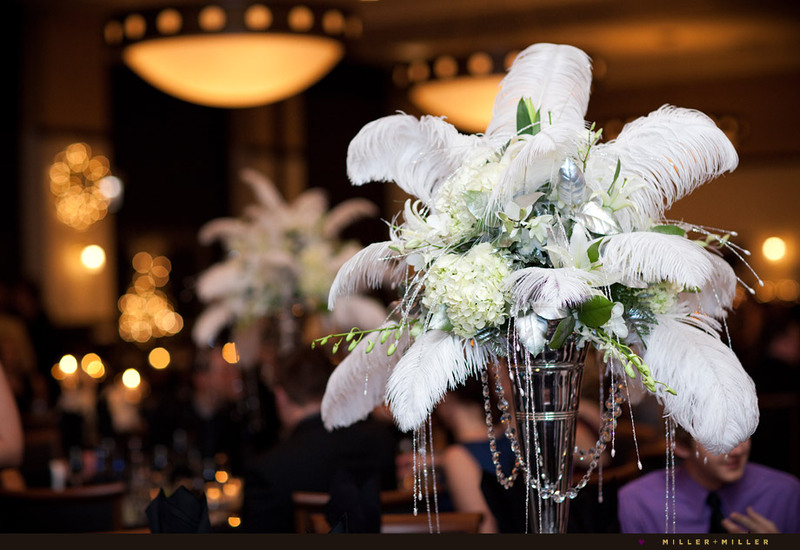 The bridal gown, the ballroom’s tables and centerpieces all were glistening, shimmering and glitzy with bling, diamonds, twinkle lights, fluffy white plume feathers, white florals, and burning candles. 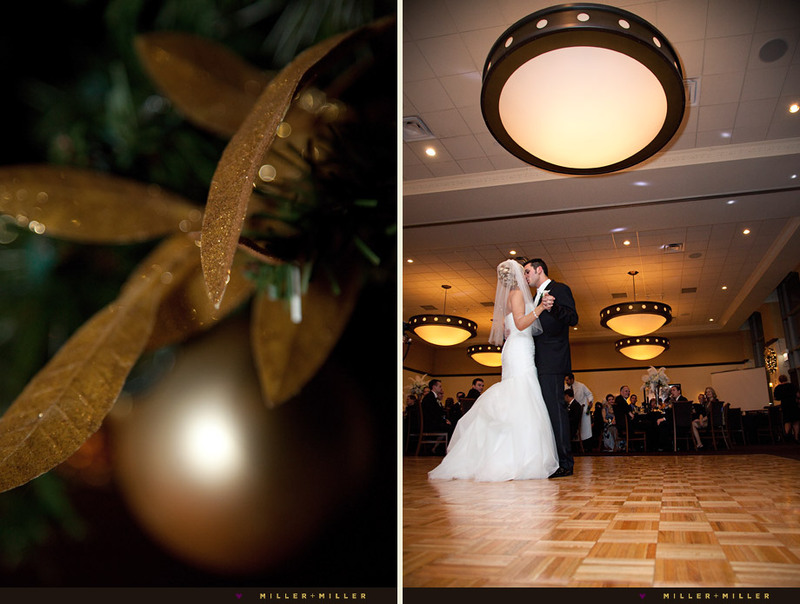 With Christmas being less than a week before, remnant shades of green and red, holiday wreaths, and decorated trees were trimmed aside the bridal party and Steve + Ashley while on stage during their 5:00 PM evening ceremony. 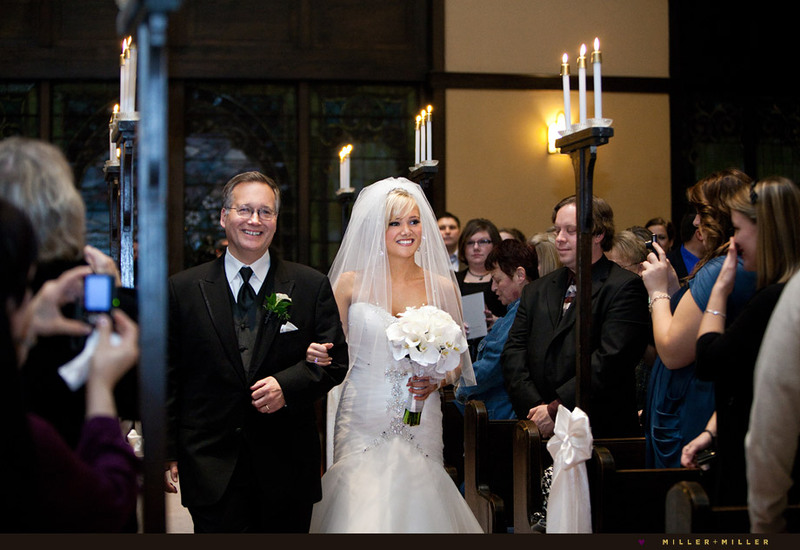 It was a romantic setting for their winter ceremony. 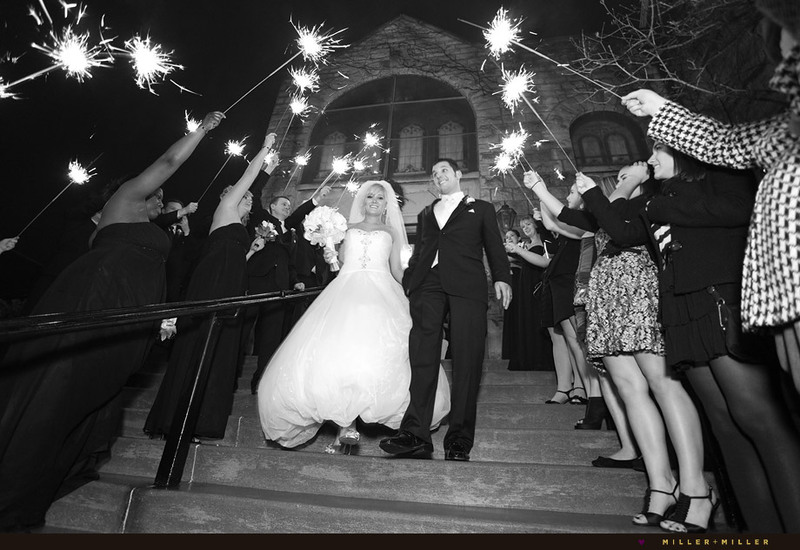 The romantic aisle was lined and illuminated by flickering candles along the path down the narrow chapel’s aisle at the historic La Grange First Congregational Church. 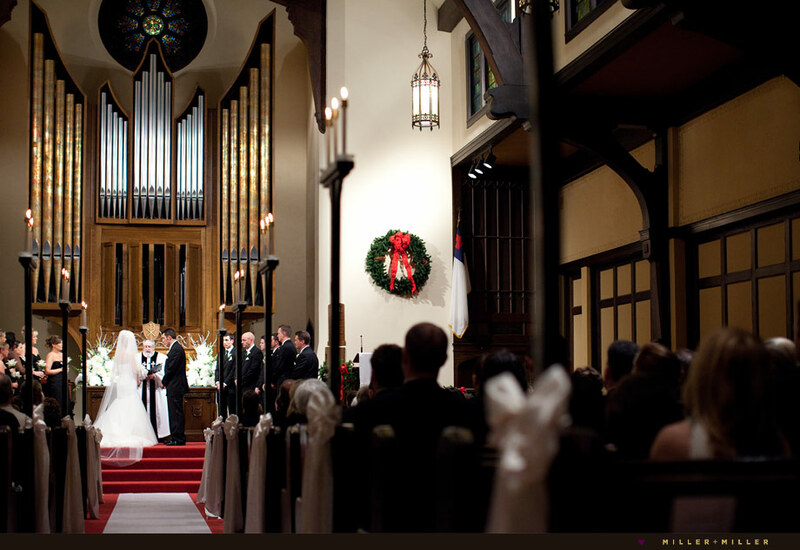 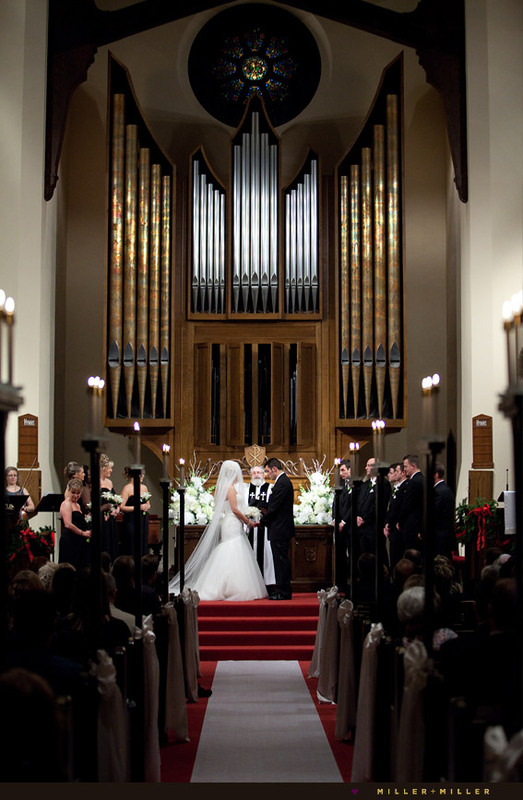 The church’s rich dark wooded pews and beams of the chapel and windows featuring stained glass warmed the room creatIng a cozy environment. 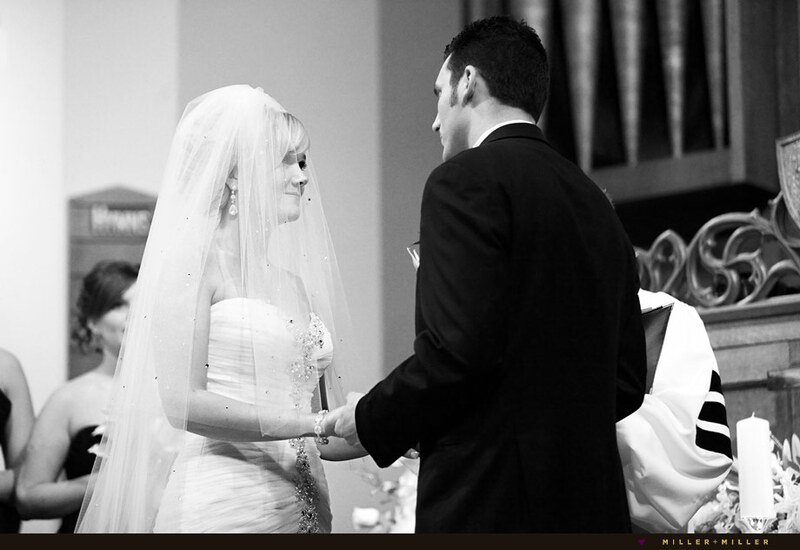 Smiles, tears and vows were exchanged during the emotional ceremony. 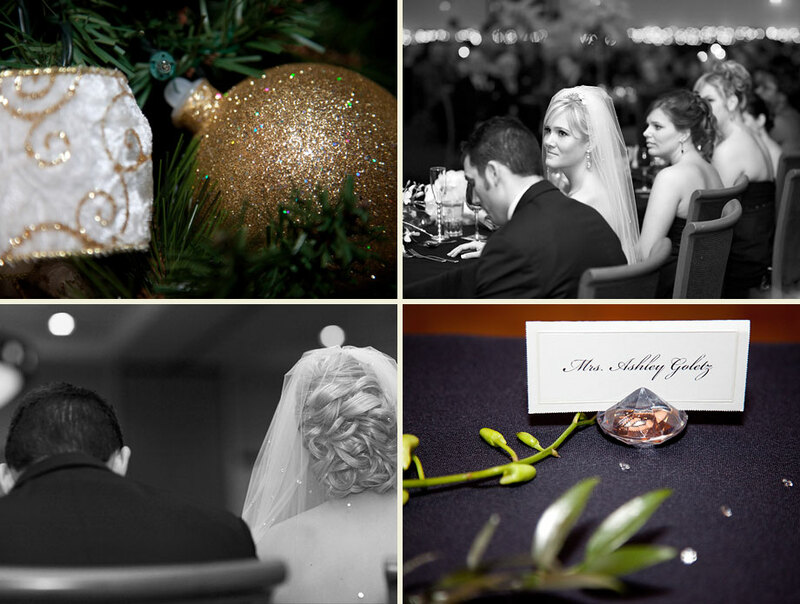 Steve + Ashley’s New Years Eve evening’s reception events, cocktails, heavy hors d’œuvre dinner, dancing, photo booth, midnight countdown, and fireworks all ringed in the year at Harry Caray’s Ballroom in the Westin in Lombard. 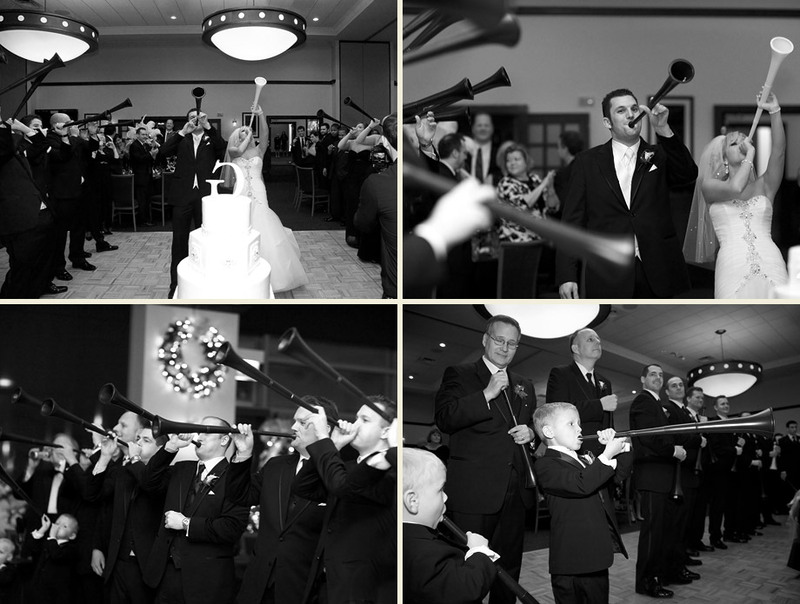 The bridal party’s arrival into the ballroom was one definitely not one unnoticed, nor unheard as each couple entered blowing into personalized vuvuzelas blow horns which everyone was madly honking as Ashley and Steve were announced! 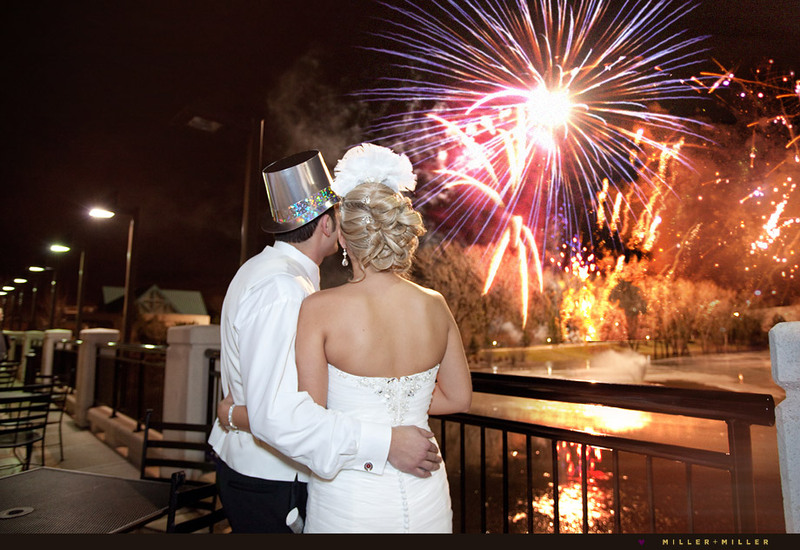 You would think that after an amazing dinner, special dances, speeches, and guest’s rockin’ our “Rock the Drop photo booth“, the night couldn’t get any more fabulous, but after the strike of midnight, the celebration moved outdoors onto the terrace where guests watch a spectacular NYE fireworks show over the pond. 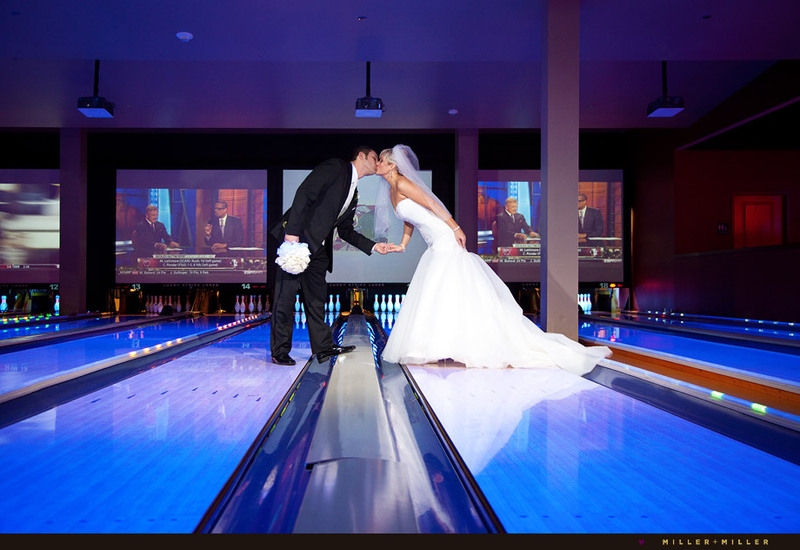 The Westin’s Harry Caray Ballroom has inside a perfect neutral decor with floor to ceiling windows and doors leading onto a private, outside terrace which overlooks a pond. 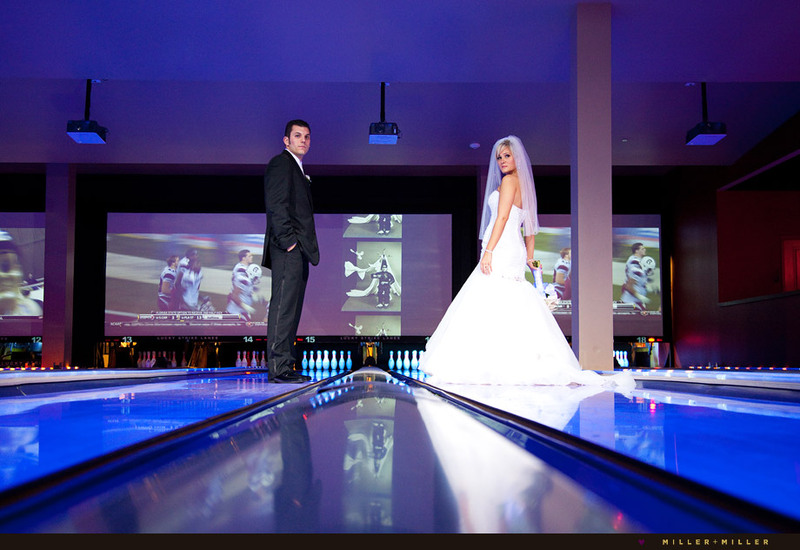 A great venue not only inside, but giving room to roam outdoors with accessible outdoor terrace space. 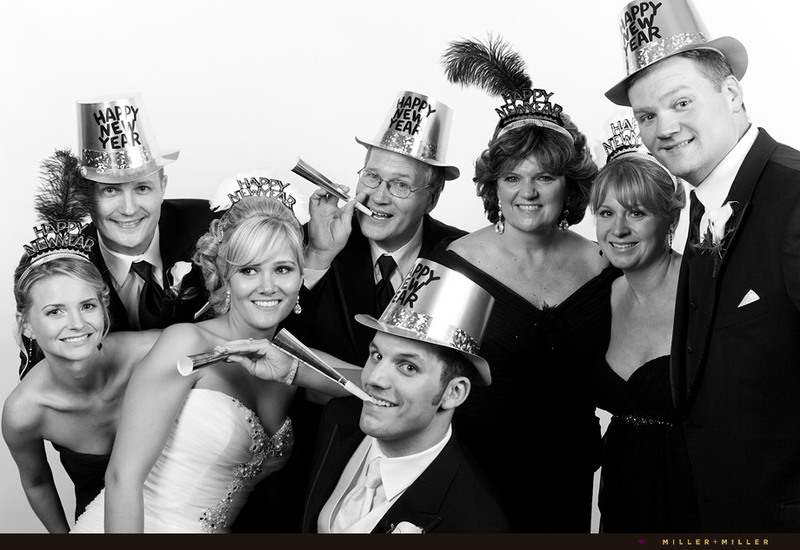 Other Fun Details: New Year’s Eve guest favors included New Year’s hats, noise makers, confetti shooters, feather tiara crowns, and personalized blow horns with Steve + Ashley’s names and wedding date. 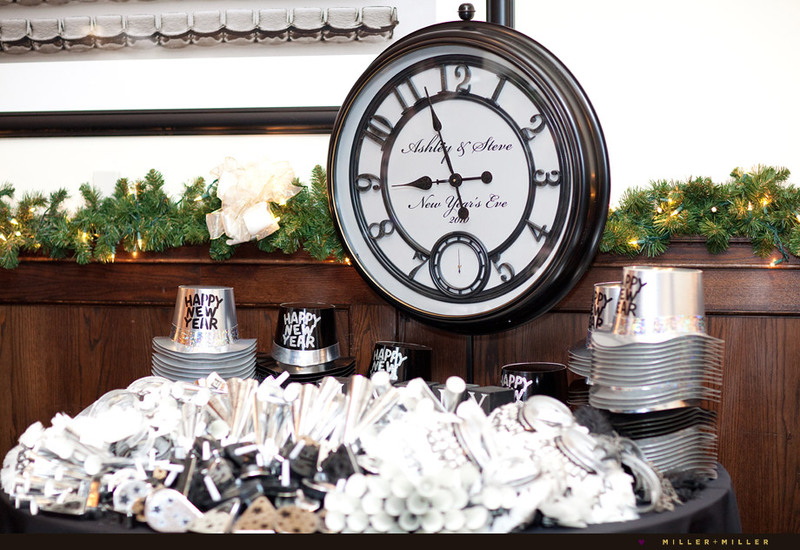 Decorations featured tons of clocks ( tying in the NYE countdown as a theme ) which they put all over the reception hall, tables, bars. 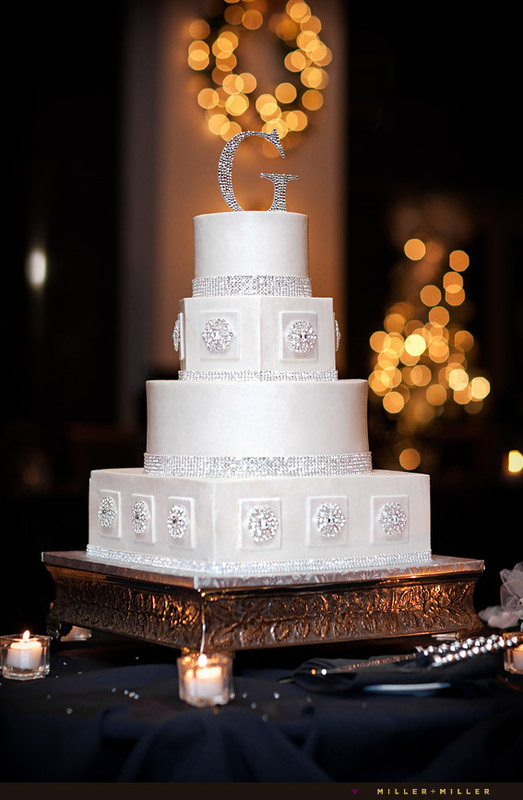 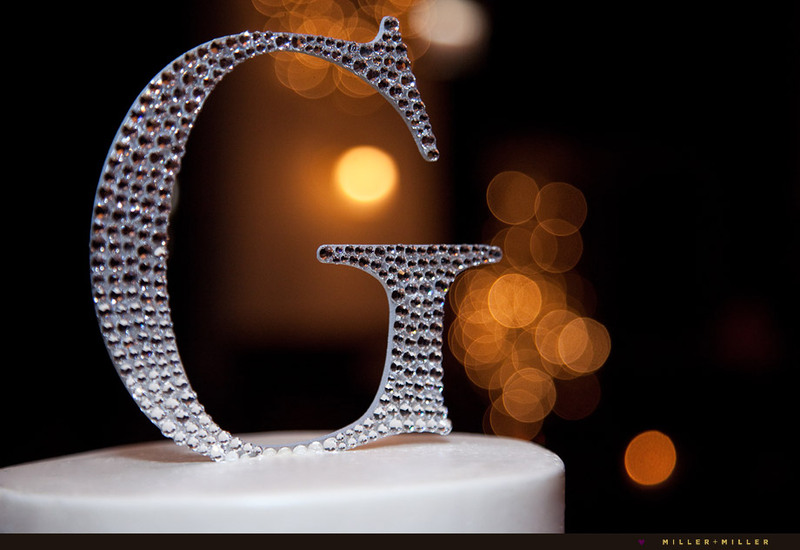 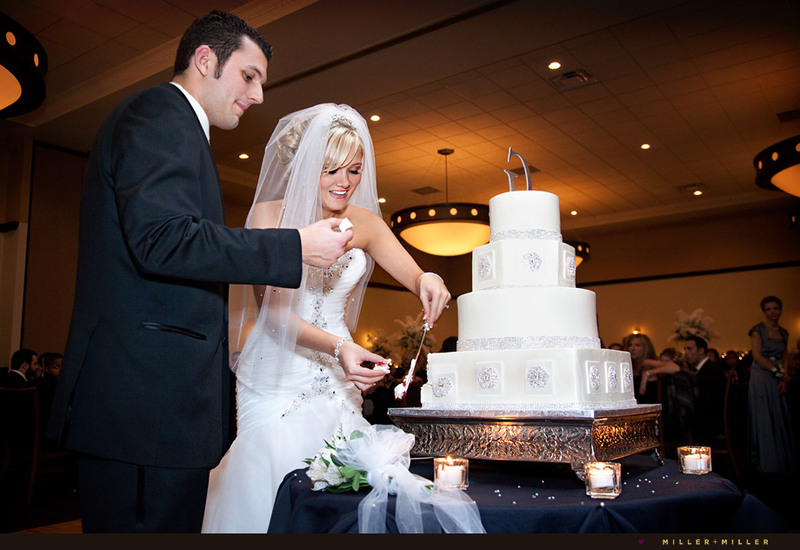 And the “bling theme” was developed with bling touches of silver diamond brooches put on the cake, bling-ing table number frames, diamond jeweled dress and jewelry, bling on the centerpieces, cake cutters, and cake topper, and a tad of bling in the bridal veil. 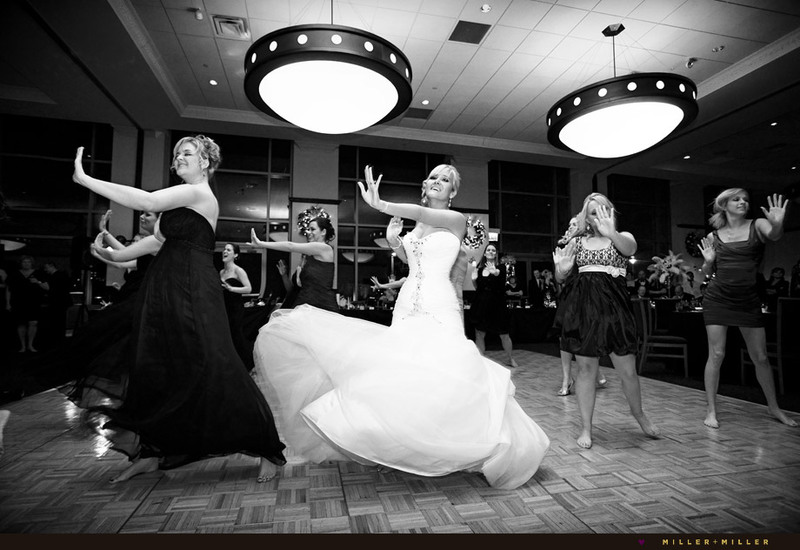 Vuvuzela horns were a tribute to Steve’s love of soccer and Ashely, the DeForest Dance Academy teachers, and bridesmaids did a dance to “Single Ladies”. 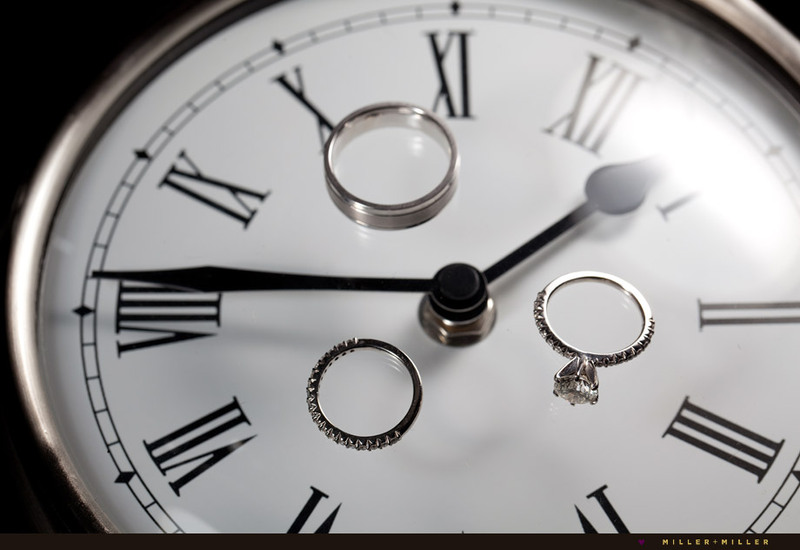 Viewed the engagement session in Chicago with Steve + Ashley yet? 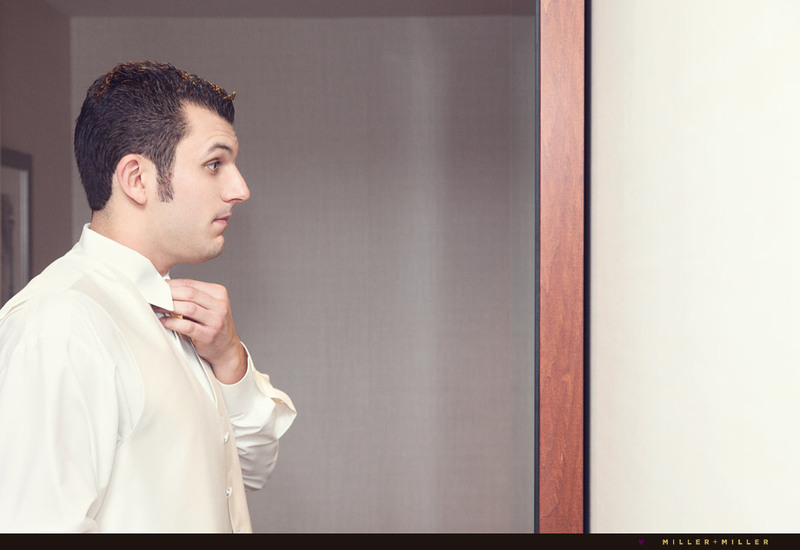 Click here to see their modern Chicago engagement photography session’s blog post.